Identifying features of the grey reef shark include dark edges on all fins except for the first dorsal fin. Coral reef drop-offs are favored habitat for grey reef sharks. A female grey reef shark off Wake Island - this species is one of the most common sharks on Indo-Pacific reefs. The lower teeth of the grey reef shark are narrower than upper teeth. Grey reef sharks become more active as night approaches. Grey reef sharks often group together during the day, such as this aggregation at Kure Atoll in the Hawaiian Islands. The posture of a grey reef shark during normal swimming (right) and a threat display (left) - the bottom line shows the shark's swimming pattern. ^ a b Smale, M.J. (2009). "Carcharhinus amblyrhynchos". The IUCN Red List of Threatened Species. 2009: e.T39365A10216946. doi:10.2305/IUCN.UK.2009-2.RLTS.T39365A10216946.en. Retrieved 23 December 2017. ^ a b c d Froese, Rainer and Pauly, Daniel, eds. (2009). "Carcharhinus amblyrhynchos" in FishBase. April 2009 version. ^ a b c d e f Martin, R.A. (March 2007). "A review of shark agonistic displays: comparison of display features and implications for shark-human interactions". Marine and Freshwater Behaviour and Physiology. 40 (1): 3–34. doi:10.1080/10236240601154872. ^ a b c d e f g h i j k Compagno, L.J.V. (1984). Sharks of the World: An Annotated and Illustrated Catalogue of Shark Species Known to Date. Rome: Food and Agricultural Organization. pp. 459–461. ISBN 978-92-5-101384-7. ^ a b Randall, J.E. ; Hoover, J.P. (1995). Coastal fishes of Oman. University of Hawaii Press. p. 29. ISBN 978-0-8248-1808-1. ^ a b Fowler, S.L. ; Cavanagh, R.D. ; Camhi, M.; Burgess, G.H. ; Cailliet, G.M. ; Fordham, S.V. ; Simpfendorfer, C.A. & Musick, J.A. (2005). Sharks, Rays and Chimaeras: The Status of the Chondrichthyan Fishes. International Union for Conservation of Nature and Natural Resources. pp. 106–109, 284–285. ISBN 978-2-8317-0700-6. ^ Garrick, J.A.F. (1982). Sharks of the genus Carcharhinus. NOAA Technical Report, NMFS Circ. 445. ^ a b c d Bester, C. Biological Profiles: Grey Reef Shark. Florida Museum of Natural History Ichthyology Department. Retrieved on April 29, 2009. ^ a b Economakis, A.E. ; Lobel, P.S. (1998). "Aggregation behavior of the grey reef shark, Carcharhinus amblyrhynchos, at Johnston Atoll, Central Pacific Ocean". Environmental Biology of Fishes. 51 (2): 129–139. doi:10.1023/A:1007416813214. ^ a b c Papastamatiou, Y.P. ; Wetherbee, B.M. ; Lowe, C.G. & Crow, G.L. (2006). "Distribution and diet of four species of carcharhinid shark in the Hawaiian Islands: evidence for resource partitioning and competitive exclusion". Marine Ecology Progress Series. 320: 239–251. doi:10.3354/meps320239. ^ a b c d Stafford-Deitsch, J. (1999). Red Sea Sharks. Trident Press. pp. 19–24, 27–32, 74–75. ISBN 978-1-900724-28-9. ^ a b c Bright, M. (2000). The Private Life of Sharks: The Truth Behind the Myth. Stackpole Books. pp. 74–76. ISBN 978-0-8117-2875-1. ^ Whitty, J. (2007). The Fragile Edge: Diving and Other Adventures in the South Pacific. Houghton Mifflin Harcourt. p. 9. ISBN 978-0-618-19716-3. ^ Justine, J. (July 2005). "Huffmanela lata n. sp. (Nematoda: Trichosomoididae: Huffmanelinae) from the shark Carcharhinus amblyrhynchos (Elasmobranchii: Carcharhinidae) off New Caledonia". Systematic Parasitology. 61 (3): 181–184. doi:10.1007/s11230-005-3160-8. PMID 16025207. ^ Newbound, D.R. ; Knott, B. (1999). "Parasitic copepods from pelagic sharks in Western Australia". Bulletin of Marine Science. 65 (3): 715–724. ^ Coetzee, M.L. ; Smit, N.J.; Grutter, A.S. & Davies, A.J. (February 2009). "Gnathia trimaculata n. sp. (Crustacea: Isopoda: Gnathiidae), an ectoparasite found parasitising requiem sharks from off Lizard Island, Great Barrier Reef, Australia". Systematic Parasitology. 72 (2): 97–112. doi:10.1007/s11230-008-9158-2. PMID 19115084. ^ Coetzee, M.L. ; Smit, N.J.; Grutter, A.S. & Davies, A.J. (2008). "A New Gnathiid (Crustacea: Isopoda) Parasitizing Two Species of Requiem Sharks from Lizard Island, Great Barrier Reef, Australia". Journal of Parasitology. 94 (3): 608–615. doi:10.1645/ge-1391r.1. ^ a b Wetherbee, B.M. ; Crow, C.G. & Lowe, C.G. (1997). "Distribution, reproduction, and diet of the gray reef shark Carcharhinus amblyrhychos in Hawaii". Marine Ecology Progress Series. 151: 181–189. doi:10.3354/meps151181. ^ Halstead, B.W. ; Auerbach, Paul S. & Campbell, D.R. (1990). A Color Atlas of Dangerous Marine Animals. CRC Press. p. 11. ISBN 978-0-8493-7139-4. ^ Robbins, W.D. (2006). 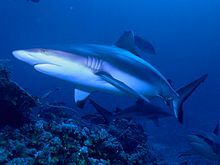 Abundance, demography and population structure of the grey reef shark (Carcharhinus amblyrhynchos) and the white tip reef shark (Triaenodon obesus) (Fam. Charcharhinidae). PhD thesis, James Cook University. ^ a b c Martin, R.A. Coral Reefs: Grey Reef Shark. ReefQuest Centre for Shark Research. Retrieved on April 30, 2009. ^ a b McKibben J.N. ; Nelson, D.R. (1986). "Pattern of movement and grouping of gray reef sharks, Carcharhinus amblyrhyncos, at Enewetak, Marshall Islands". Bulletin of Marine Science. 38: 89–110. ^ a b Nelson, D.R. (1981). "Aggression in sharks: is the grey reef shark different?". Oceanus. 24: 45–56. ^ a b Taylor, L.R. (1993). Sharks of Hawaii: Their Biology and Cultural Significance. University of Hawaii Press. pp. 21–24. ISBN 978-0-8248-1562-2. ^ ISAF Statistics on Attacking Species of Shark. International Shark Attack File, Florida Museum of Natural History, University of Florida. Retrieved on May 1, 2009. ^ Anderson, R.C. ; Sheppard, C.; Spalding, M. & Crosby, R. (1998). "Shortage of sharks at Chagos". Shark News. 10: 1–3. ^ Robbins, W.D. ; Hisano, M.; Connolly, S.R. & Choat, J.H. (2006). "Ongoing collapse of coral reef shark populations". Current Biology. 16 (23): 2314–2319. doi:10.1016/j.cub.2006.09.044. PMID 17141612. Wikimedia Commons has media related to Carcharhinus amblyrhynchos.